The Pacific Humanitarian Challenge is seeking innovative ways to prepare and respond to natural disasters in the Paciﬁc. As the February 7, 2016 application deadline approaches, Patrick Meier, author of Digital Humanitarians, and a leading thinker in humanitarian technology and innovation, shares his thoughts about innovation in this space. 1. Your book, Digital Humanitarians, looks at how big data is changing the face of humanitarian response. Who is a digital humanitarian and how can smarter crowdsourcing help save lives? A digital humanitarian is anyone who uses emerging technologies and advanced computing to support humanitarian efforts worldwide. Smarter crowdsourcing can support said efforts by rapidly making sense of the Big Data that gets generated during disasters, such as social media and satellite imagery. The faster this data is filtered and analyzed, the faster humanitarian organisations can assess the damage and coordinate relief efforts. Drone used for mapping after humanitarian crises, including Cyclone Pam in 2015 and the Nepal earthquake of 2015. 2. On the credibility of Tweets and Facebook posts after a crisis, you’ve talked about the need to combine investigative journalism strategies with new technologies powered by artificial intelligence. How would that work in verifying social media posts? The TweetCred platform combines crowdsourcing and machine learning to automatically score the credibility of crisis-related tweets. The platform can thus serve as a first “early warning signal” of potentially credible (and non-credible) information generated after a crisis. This on its own is insufficient, however. Hence the need for investigative journalism strategies to follow up and triangulate these signals with other sources and techniques. Patrick Meier carrying out an aerial assessment following Nepal Earthquake. 3. You are an advocate for civilian drone technology. 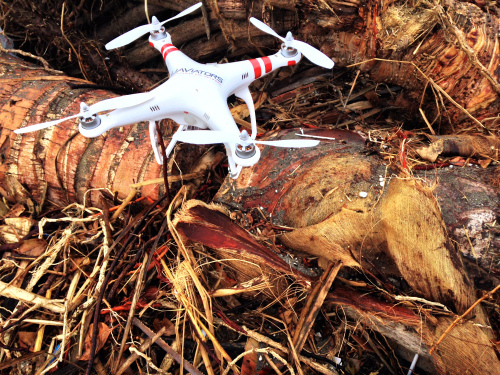 What do you mean and how are UAV’s or drones being used in disaster response? Drones or UAVs (unmanned aerial vehicles) are simply flying robots. As such, I’m an advocate for the use of intelligent, autonomous robotics in general vis-a-vis disaster response. Aerial robots can be programmed to rapidly collect very high resolution aerial imagery and to transport essential payloads in support of disaster response efforts. For example, I spearheaded a humanitarian UAV mission for the World Bank after Cyclone Pam devastated the islands of Vanuatu last March. 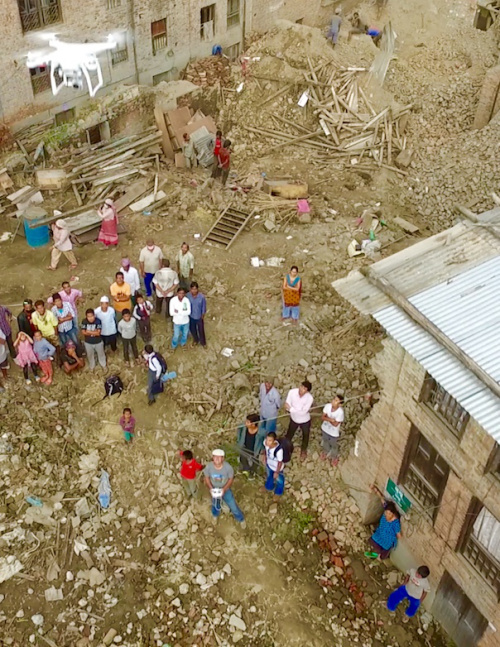 The mission focused on carrying out aerial surveys of the disaster affected areas in order to complement the field-based damage assessment surveys. This year, my team and I are heading back to Nepal to pilot the use of payload delivery via UAV as part of a public health project in one of the most remote, mountainous regions of Nepal. It typically takes about 7 hours to transport medicines to and from health clinics and hospitals in the region in question. This is done by car and on foot. A UAV would only take 20 minutes to delivery the medicines. 4. What kinds of humanitarian technology innovations do you envision in the future? I’m particularly interested in the application of next generation robotics, including terrestrial and maritime robotics vis-a-vis the future of disaster response. We’re already seeing tremendous strides being made with self-driving vehicles. Is it only a matter of time until we start considering self-driving humanitarian convoys and ships? I’m also interested in cargo delivery via UAV. This too holds great promise. But like most emerging technologies, one of the main challenges in applying them to humanitarian contexts is regulatory hurdles, like the regulations around the use of UAVs. So the speed at which next generation robotics gets mainstreamed within the humanitarian space will largely depend on whether the international humanitarian community takes a leadership role in conversations with regulatory bodies. Patrick Meier, author of Digital Humanitarians, is also the founder of the Humanitarian UAV Network. He sits on the Advisory Board for the Pacific Humanitarian Challenge. His popular blog is iRevolutions. Since November, citizens, entrepreneurs, scientists, and communities from the Pacific have been encouraged to join Australia’s Pacific Humanitarian Challenge and work together to develop ideas. The winning submissions will be announced at the World Humanitarian Summit in Istanbul in May 2016. The winners will be awarded combined funding of up to $2 million to pilot their ideas in the Pacific. The deadline is February 7th! ← Challenge Accepted! What Comes Next?